Bruce Bairnsfather (1888-1959) was the creator of 'Old Bill', the cartoon character who perhaps best illustrated the practical philosophy of the British private soldier during World War One. Following schooling both in India and in Britain Bairnsfather signed up for a period with the army in the Royal Warwickshire Regiment. Finding himself quickly bored however he left the army and enrolled as an art student at the Hassall School of Art. Emerging from his training he was initially employed designing advertising posters for household staples such as Lipton Tea and Player's tobacco. Unable to secure further art work however he was engaged by a firm of electrical joiners as a representative. Recalled to his old regiment with the outbreak of war in August 1914, Bairnsfather was rapidly promoted Lieutenant and, following the British army's stand at Mons, sent to the Western Front to help relieve the chronic shortage of manpower experienced at that time by the British in Flanders. Assigned command of a machine gun section (at that stage using the Maxim rather than the Vickers machine gun) Bairnsfather confessed later to feeling appalled at the horrors he experienced at the front (so much so he claimed that he declined leave home on the grounds that he would probably be disinclined to return). "It all felt most curious: here were these sausage-eating wretches, who had elected to start this infernal European fracas, and in so doing had brought us all into the same muddy pickle as themselves... There was not an atom of hate on either side that day; and yet, on our side, not for a moment was the will to war and the will to beat them relaxed." While serving at the front Bairnsfather began to draw sketches of day to day trench life from the perspective of the average soldier, that saw initial publication in the Bystander magazine in 1915. 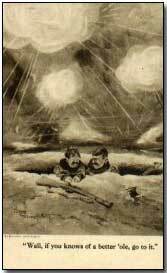 Suffering from the effects of a chlorine gas attack in the wake of the Second Battle of Ypres in April 1915, Bairnsfather was subsequently wounded by a shell explosion and sent home to Britain to recuperate. While at the London General Hospital in London he was diagnosed as suffering from the effects of shell shock. It was while in hospital that the Bystander commissioned him to produce a series of weekly drawings that were subsequently published as the six-volume Fragments from France. With his recuperation complete the government dispatched Bairnsfather to the Isle of Wight to oversee the training of fresh recruits bound for France and Flanders. It was during this period that he created the character 'Old Bill', which rapidly brought its creator widespread praise and popularity. The government, recognising the propaganda potential of Bairnsfather's cartoons, chose not to return him to the battlefields (performing no further active service). Instead he was sent on drawing missions to cover the U.S. and Italian forces. Numerous plays and films based upon Bairnsfather's Old Bill character were produced during the 1920s and 1930s. Bairnsfather, somewhat embittered by the treatment of returning veterans following the war, often acted as their unofficial spokesman, and opposed the construction of the Menin Gate in Ypres, opened in 1927 (the money would have been better spent on wounded veterans he argued). Bairnsfather continued to produce further books and drawings including Carry on Sergeant! (1927), Old Bill Looks at Europe (1935) and Old Bill Stands By (1939), although he never regained his wartime popularity. During the Second World War he was employed an official cartoonist to the U.S. forces stationed in Europe. Having published two volumes of memoirs, Bullets & Billets (1916) and From Mud to Mufti (1919), Bairnsfather died on 29 September 1959 in Worcestershire at the age of 71. Click here to read a feature documenting the creation of an irreverent post-war veterans' organisation with links to Bruce Bairnsfather's most famous cartoon character.